As a vegetarian, I am always looking for innovative ways to make meals interesting and tasty, as well as nutritious, for the whole family. 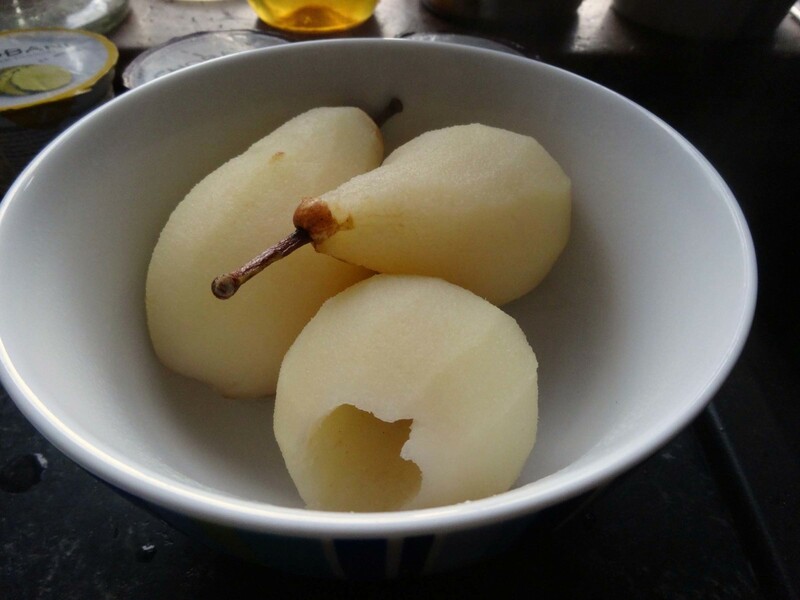 Using one pear per serving, thinly peel each pear but keep the stalks on; optionally (so as not to waste goodness) the skins could be put to one side and used as decoration or chopped up and added to the other fruit later. Optionally, you can core the pear from the bottom to get the pips out; but this is a bit fiddly, although I did manage it with an apple corer and a thin knife without dislodging the stalk. Put one pint of water and the sugar into a saucepan and stir over a gentle heat until the sugar is dissolved. 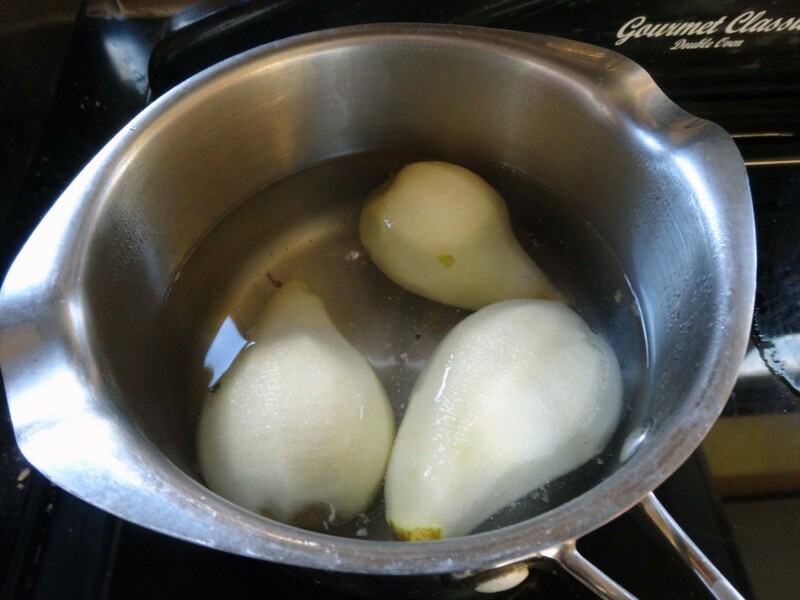 Add the vanilla essence and pears to the saucepan and simmer on a gentle heat for 20 minutes; but do not overcook. Once gently cooked remove the pears from the water and leave to cool. Empty a yogurt pot into each dessert dish (one glass dish per person); or alternatively custard. 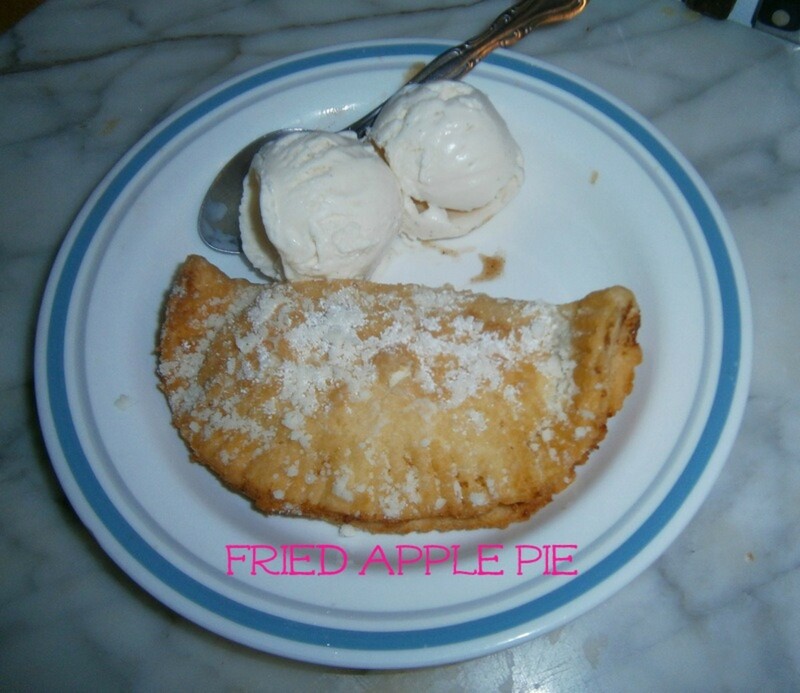 If using custard instead let it cool before adding the pear and other fruits. 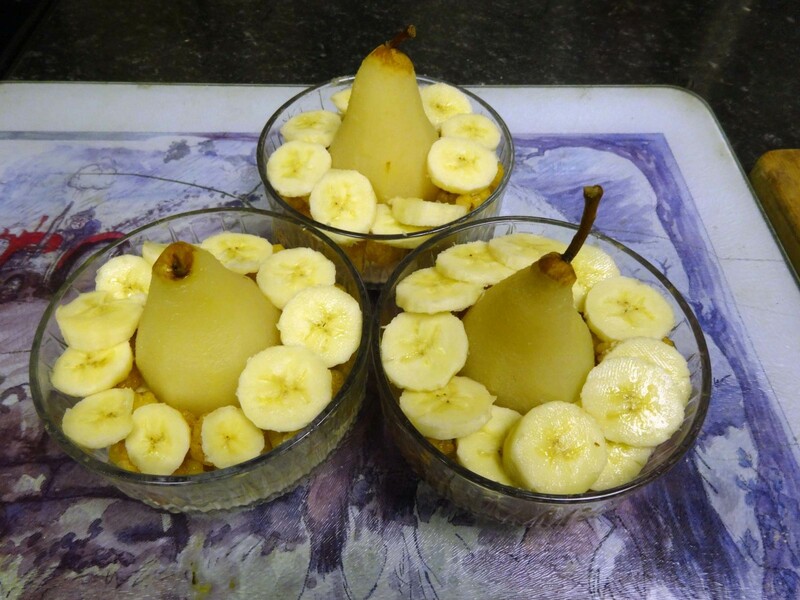 Place a pear in the centre of each dessert dish on top of the yogurt (or custard). Evenly spread the raspberries around the outside of the pear on top of the yogurt (or custard). Thinly slice the banana and equally spread the sliced banana round the edge of the dish on top of the raspberries. For three pears or less one banana should be sufficient; if serving four or more pears then use two bananas. Leave to stand while you prepare and enjoy your main meal and serve as the second course. Optionally you can either stand on the kitchen counter to cool, or chill in the fridge. 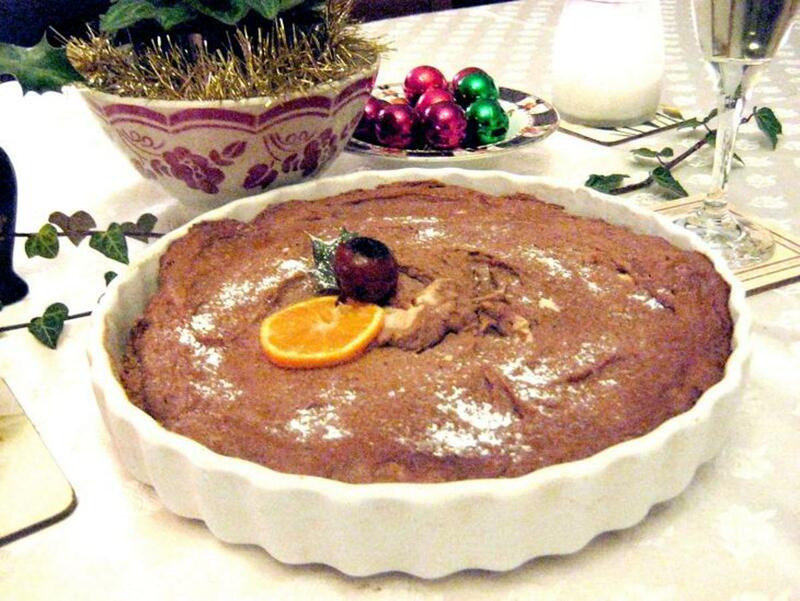 This is a dessert dish best prepared before the main meal and left to cool so it’s ready as a second course. Pears gently simmered in water until cooked with a few drops of vanilla essence and sugar. 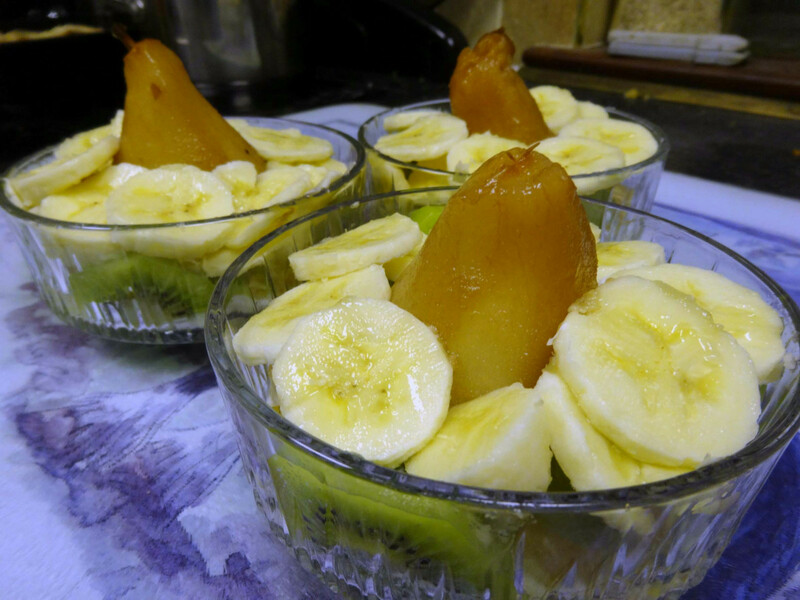 Pears left to cool before adding to the dessert dish with the other fruits. 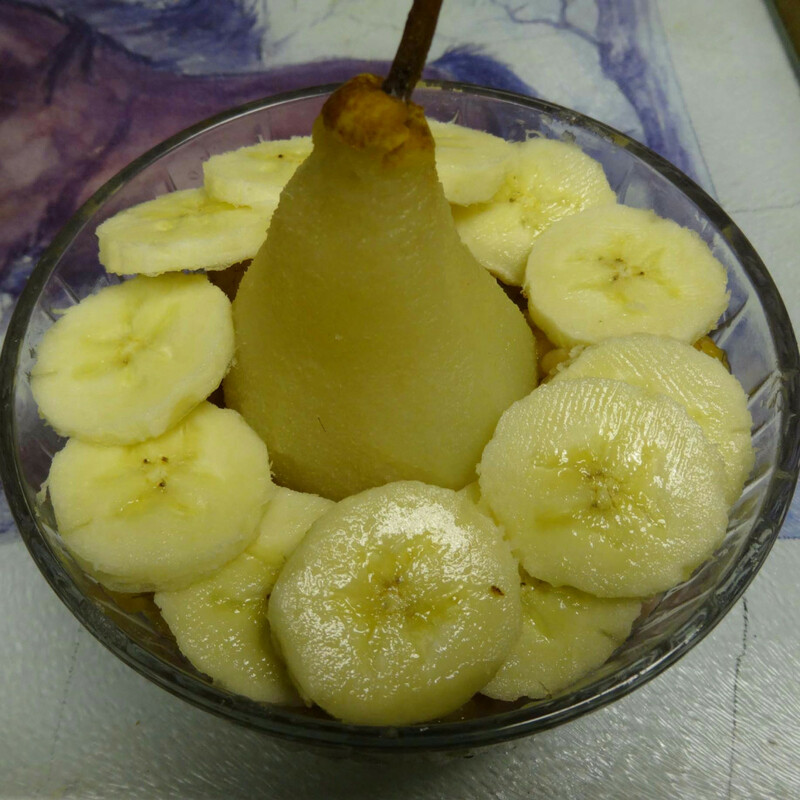 Placing the pears in the dessert dish, on top of the yogurt and then adding raspberries and sliced bananas around the sides. 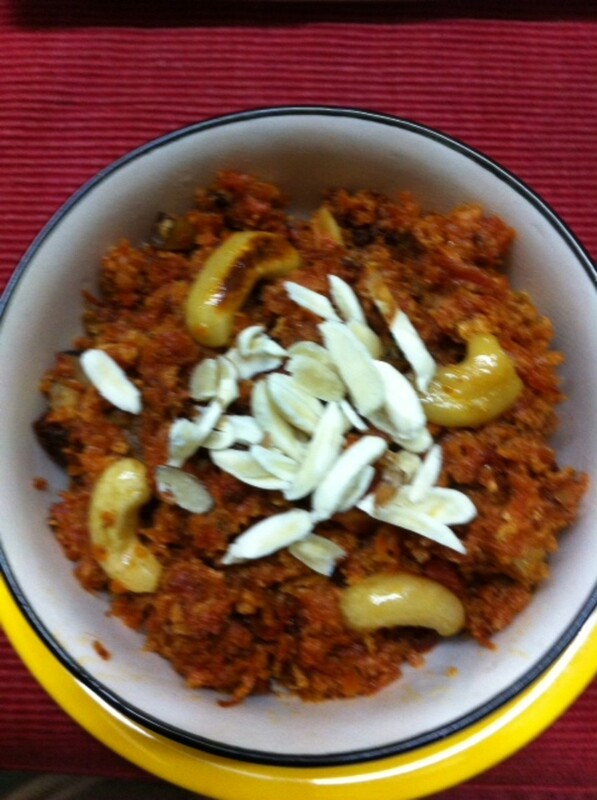 The dish is now ready to serve as a nutritious and appetising dessert. 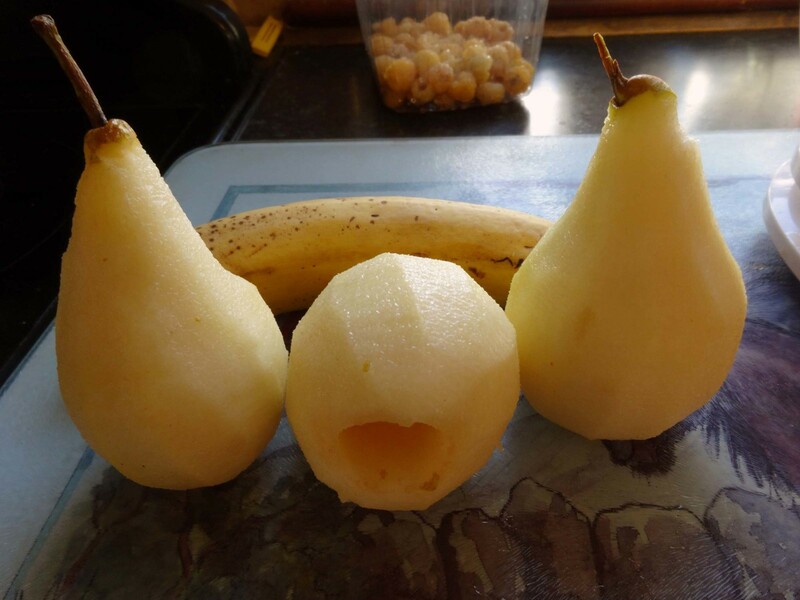 Whether you use 3, 4 or 6 pears you use the same amount of water, sugar and vanilla essence, and raspberries; although for 3 pears one banana is sufficient. I used yellow raspberries (picked fresh from the garden that morning), which was appropriate for my yellow theme dish; although traditional red raspberries would work just as well in that when you serve up the raspberries are hidden from view by the banana. What yogurt you use is immaterial, I used cherry for two of the dishes and raspberry for the third one; all were equally yummy. An alternative to yogurt would have been custard; which for this kind of dish works equally as well provided the custard is allowed to cool before serving up. 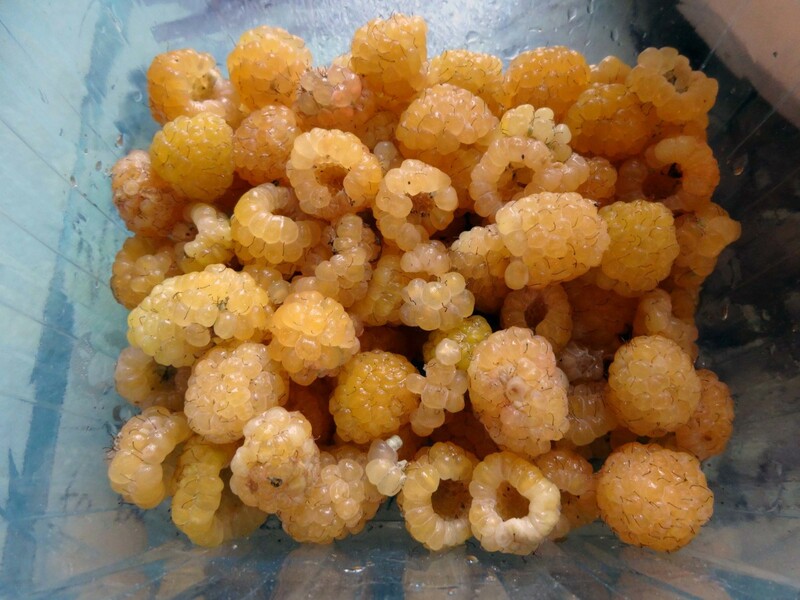 Yellow raspberries picked from our garden, although red raspberries would work just as well for this recipe. Peeling and coring pears by hand can be a bit tiresome and time consuming if you are doing more than just one or two pears. This labour saving device makes preparation a lot easier and quicker, and is a great solution for dessert recipes that uses lots of apples and pears. Complementary substitution is the name of the game, either when I don’t have to hand the suggested recipe ingredients, when I’m adapting a recipe to a vegetarian dish, making a recipe healthier or when I fancy to be a little innovative or experimental. The sunset pears recipe is a prime example where the ingredients included blackcurrants. I substituted the blackcurrants with bananas firstly because I didn’t have any blackcurrants to hand and secondly because my dish is a yellow theme and not pink (like the original recipe), so bananas seemed more appropriate. Apart from which bananas are a refreshing fruit that goes well with the other ingredients I was using, namely the pears, raspberries and yogurt. Using what you have to hand is a time saver, can save money on your food bill and reduces the risk of wasting good food. In adapting a recipe to use what you have in the kitchen means you can get on and produce what could be a potentially tasty dish rather than putting it off until you have the right ingredients; it may also save you time in not having to make a special trip to the local shop to buy just one or two ingredients. It also means that you better ensure using up ingredients which if they are fresh food may otherwise go off before they are eaten. And it gives you a chance to be innovative and experimental with your menus. Looking for other great recipe ideas with pears, also plums and peaches, then this colourful book packed with 40 such recipes should be a great source of inspiration. Harvesting a good crop of soft fruits fresh from our garden has invariably meant lots of fruit cocktails this summer. So I wanted to do something a little different for the family this time; a dish other than plain simple fruit cocktail that’s also packed with lots of wholesome goodness and flavour. In particular, also with a good harvest of pears from our fruit tree I wanted a fruit cocktail recipe featuring pears that’s tasty, quick and straightforward to make. In thumbing through our recipe books for ideas I didn’t find much, other than a dessert called ‘Sunset Pears’; therefore with a little thought (while having a cup of coffee) I adapted the Sunset Pears recipe to concoct this recipe. 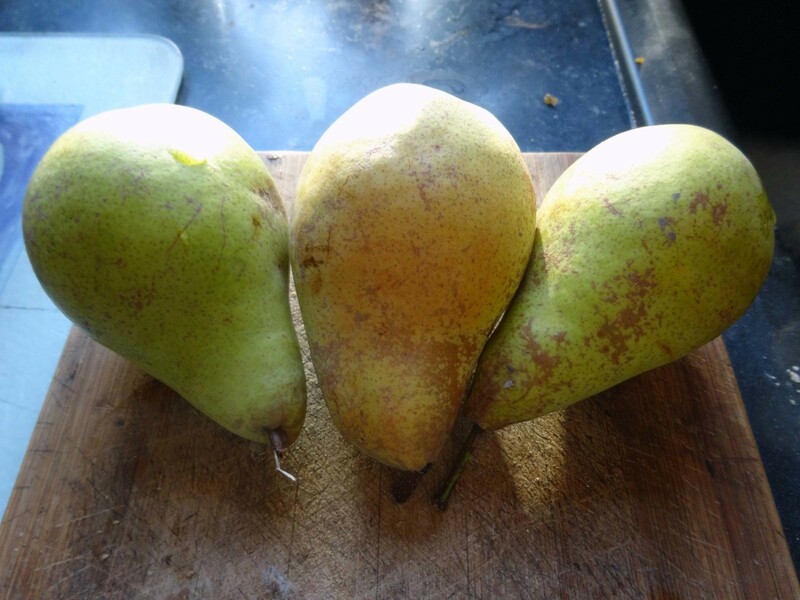 Being innovative with recipes the main ingredients for Sunset Pears are pears and raspberries; the two main ingredients I had to hand, having just recently harvested the pears from our tree and that very morning picked a punnet of autumn ‘yellow’ raspberries. The one thing I didn’t like about the ‘Sunset Pears’ recipe is using the raspberries to make a puree; it seems such an unnecessary desecration of fresh fruit straight from the garden. The purpose of making the puree is that the pink fluid is poured over cooked pears to give them a pink glow; hence the name Sunset Pears. However, my autumn raspberries are yellow and not pink; so my dish (short of using food colouring) would be yellow, not pink; hence the recipe name, Sunrise Pear. 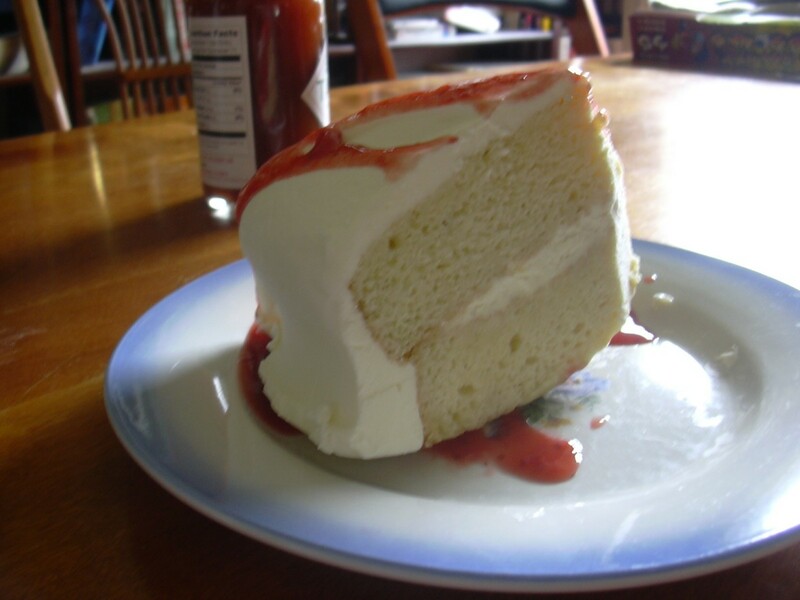 Rather than use raspberry puree I decided to use yogurt; I’ve used it in other fresh fruit recipes, and it’s always a winner. Equally, I could have used custard to the same good effect, which is best served cool for this type of dish. Whether you use yogurt or custard, as it’s best served cool it’s a dish which can be prepared before the main dish and served after. 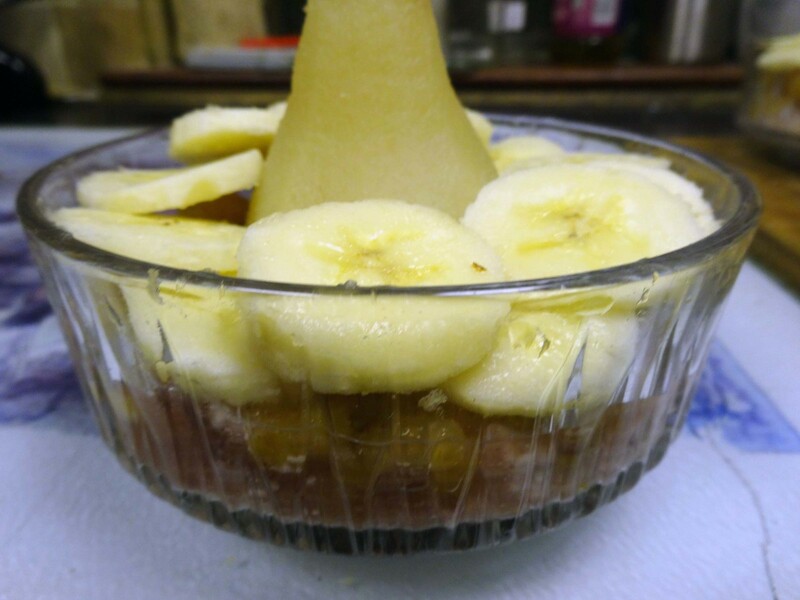 The other ingredient I opted to use to really freshen-up the dish, which was not in the Sunset Pear recipe, was the addition of banana; and with a few other tweaks to the original recipe I served-up a fruity dish which the whole family demolished with delight.